This is a Mass Effect Andromeda planet locations guide on the planet, Voeld. Here, you will learn details about the planet’s climate, wildlife, and indigenous species. We will be updating this as more information comes out. A planet that is blanketed in an endless winter. Its a harsh climate is hazardous to your health. 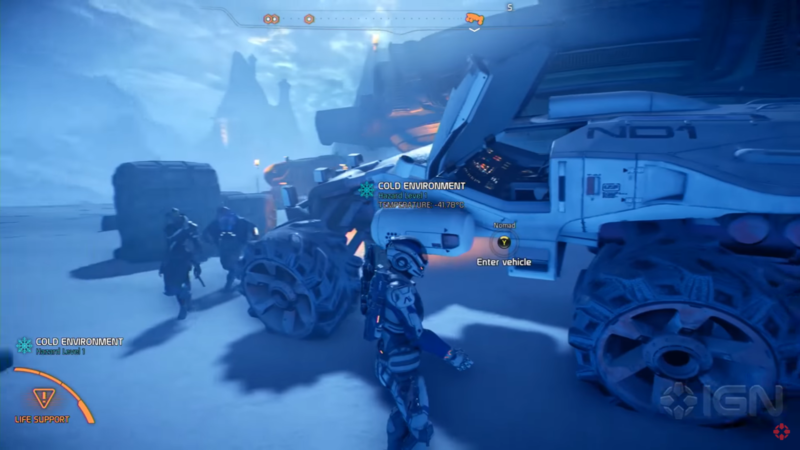 Ice will also present a hazard to driving your nomad, as it makes things slippery for its six wheels. Some Angara and Kett inhabit this ice world. From the Milky Way, the Initiative identified this planet as Habitat 6, a “golden world” projected to be a life-sustaining and temperate garden world. This is confirmed by angaran historians: the planet was once a heavily populated and thriving angaran colony. During the Scourge event, gravitational distortions affected the planet’s orbit. Models from the Nexus tech labs show this triggered a minor ice age. The angara were forced to withdraw to a few urban centers, with the rest of the planet’s population scattered in smaller settlements. Voeld is therefore both culturally and strategically important to the angara, and has drawn the attention of the kett. Reports suggest a significant military presence on both sides, as the Angaran Resistance fight to defend Voeld’s population and protect the ice-encased remains of their world.